“Next to Normal” is not for the faint-hearted. With its strong subject matter: mental illness, family dysfunction, and extreme medical treatment and its ear-shattering rock-opera score, it is definitely a test of its audiences’ emotional stamina. But it is also an extremely poignant tale of a family’s daily struggles, sacrifices, and bonds of love. With music composed by Tom Kitt and book and lyrics by Brian Yorkey, this durable show is worth every note and word of its 2010 Pulitzer Prize. Christiane Noll (Tony nominee for “Ragtime”) is Diana, the at-first seemingly perfect wife and mother as shown in the show’s opening song “Just Another Day”. But soon its evident that all is not well with Diana who suffers from bi-polar disorder. Her understanding but aloof husband Dan (David Harris) tries unsuccessfully to support Diana as voiced in the songs “It’s Gonna Be Good”, “Better than Before”, and “Song of Forgetting”. Diana and Dan’s only child Natalie’s (Maya Keleher) teenage angst is compounded by her mother’s illness. However, her knight in shining armor comes in the form of pot-smoking fellow musician Henry (Nick Sacks) and their special bond is tenderly expressed in “ Perfect for You”. Diana’s psycho-pharmacologists Drs. Fine/Madden (J.D. Daw) attempts to help Diana with a variety of treatments. But the root of Diana’s depression and anxiety is linked to the figure of Gabe (John Cardoza) who is not all he seems to be. The score is magnificently sung by the entire cast and the show’s well-known hits “I Miss the Mountains”, “I am the One”, “Superboy and the Invisible Girl”, and especially Gabe’s rendition of “I’m Alive” are sublimely memorable. Rob Ruggiero’s glossy direction keeps the action moving which prevents the story from becoming maudlin. Adam Souza’s musical direction is lively and powerful. Tricia Barsamian’s costumes are simple and modern, playing second fiddle to John Lasiter’s stunning and bold lighting design. Wilson Chin’s fussy, overly ornate set, however, resembles more of a Pottery Barn showroom than a living room. 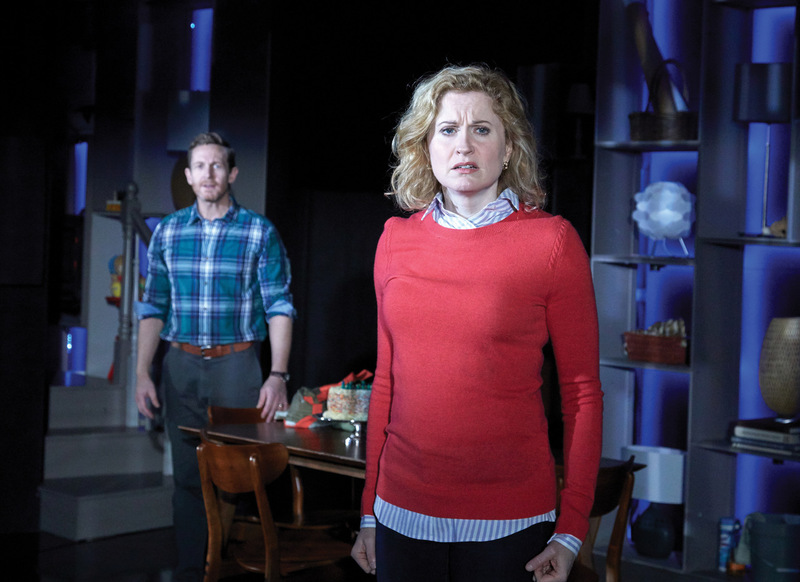 Despite its 2 ½ hour running time, “Next to Normal” will leave you emotionally sapped and perhaps a bit dewy-eyed as well.